For centuries, the Sistine Chapel frescoes were characterized by muted colors and dark shadows. Some people even assumed that Michelangelo, who saw himself as a sculptor rather than a painter, was more interested inform than color. But a major restoration project in the 1980s showed what a thorough cleaning can do. Over the course of a decade and in the center of a swirling international controversy, conservators used computer technology and chemical solvents to repair damaged sections and wipe away the accumulated grime. Their efforts uncovered a brilliantly colorful ceiling that revealed Michelangelo's genius anew. When the project was completed in 1990, the New York Times called the result “overwhelmingly beautiful.” Restoration of Michelangelo's Last Judgment on the altar wall soon followed. During the Renaissance, the humanists' efforts to study ancient texts and to purify Christianity [see p. 14] led to a number of groundbreaking discoveries. The classical scholar Lorenzo Valla (1406-1457) proved that the “Donation of Constantine”a document granting the pope temporal power over the Western Roman Empirecould not have been written by the emperor Constantine but was a later forgery. Valla also shocked the church by arguing that the twelve apostles did not compose the Apostles' Creed and that the Latin Vulgate version of the Bible was full of errors when compared to early Greek manuscripts. His work deeply influenced Erasmus of Rotterdam, who published an edition of the Greek New Testament in 1516, as well as the Protestant Reformers. During the Renaissance, artists' guilds adopted as their patron saint the author of the third gospel, and a 16th-century painting academy in Rome was even named after him. Why? According to an early tradition, Luke was not only a physician but also a painter. One legend held the wife of Emperor Theodosius II brought back from the Holy Land a portrait of the Virgin Mary painted from life by Luke himself. Much of what we know about the life of Michelangelo, as well as many other Renaissance artists, comes from the painter, architect, and biographer Georgio Vasari (1511-74). Vasari's immensely popular Lives of the Most Excellent Painters, Sculptors, and Architects, first published in 1550 and expanded and revised in 1568, laid the foundation for centuries of art historians. It chronicles the development of Italian art from the 14th to the 16th centuries, climaxing in Michelangelo, whom Vasari idolized. Michelangelo, on the other hand, didn't have the same high opinion of Vasari's first edition. He had his pupil Ascanio Condivi write another account of his life to set the record straight. As a young teenager, Michelangelo worked for a short time as an apprentice in the workshop of a local Florentine painter Domenico Ghirlandaio. Ghirlandaio gave him one of his own paintings to copy as an exercise. Michelangelo, not entirely appreciative of his master's talents, copied the painting and then, as a prank, passed off his copy as the original. As biographer James Beck describes, “he even doctored his panel with smoke so that it would appear the same age as Ghirlandaio's.” The precocious artist didn't stay in that workshop much longer. According to Vasari and other early biographers, while Michelangelo was an up-and-coming young sculptor in Rome he overheard some people discussing his new Pietˆ in St. Peter's Basilica [see p. 27] and attributing it to another artist. Michelangelo was irritated that the praise for all of his hard work was wrongly going to someone else, so he returned at night and carved the words “Michelangelo Buonoratti, Florentine, made this” in a prominent place on the sash across Mary's chest. He never again signed any of his work. One of the most infamous events in Michelangelo's long life was his argument as a young man with another artist, Pietro Torrigiani, possibly over the merits of one of Michelangelo's favorite painters, Masaccio. The squabble ended when the jealous, hot-tempered Torrigiani punched Michelangelo in the nose so hard that (he bragged later) “I felt the bone and cartilage of the nose give way, as if it were sponge cake; and thus, marked by me, he will remain for the rest of his life.” Michelangelo's permanently squashed nose was a lifelong sore point in his self-image and shows up in numerous portraits of the artist. So legendary has this deformed protuberance become that art historian Paul Barolsky even centered an entire psychological study of Michelangelo around, as he puts it, one of the greatest noses in history. 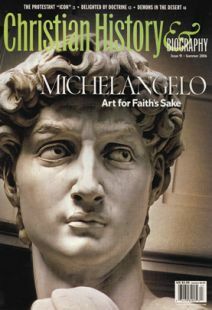 Some historians have identified Michelangelo as part of a religious circle known as “Nicodemites” (a term used by John Calvin, alluding to the Pharisee who came to Jesus only by night for fear of being discovered in conversation with him). For the Genevan reformer, “Nicodemites” were those who concealed their Protestant beliefs behind an outward show of Catholic conformitya kind of cowardice. However, for those who took the name for themselves, it could be a badge of honor. After all, Nicodemus showed up courageously and faithfully at the crucifixion.